“Aside from being cheap, it was a ‘throw-away-after-use’ item, primitive in looks but reliable and easy to obtain. They even made “ball pen” guns, chambered for cal.22 LR (Long Rifle). “Thus came the era of the Danao-made revolvers, with chambering set either for the twenty-two and the twenty-two magnum, cal. 32 and cal. 38. He traced the industry to one Mario Durano who taught the skill to family and friends and who, in turn, taught it to others. “When martial law was declared in 1972, every gunsmith went into hiding. They buried all their tools, products, and other illegal items for fear of being arrested. “They re-surfaced in 1973 and were manufacturing handcuffs and thumbcuffs instead for law enforcement people and interested civilians. These were not illegal and it restored part of their lost income. “They took can openers and refashioned them as keys for the cuffs. “In the end, they still went back to gun making because the demand for their products continued. People were looking for it to protect their homes and families. “They began making revolvers for more powerful calibers including the .357 Magnum and ammunition designed for the M16 (5.56mm) and the M1 Garand (cal. 30-06) rifles. “I saw them test fire the revolver chambered for the Garand ammo, and it was great. I stood 20 yards away, afraid that it might blow, up but it never did. They fired five rounds in succession without any hitch. “I remembered in the late ’80s when the Cebu Pistol and Rifle Association invited Smith and Wesson to come to the range and display/test fire their new products for the police, they sent no other than IPSC shooter Tom Campbell to do the demo. 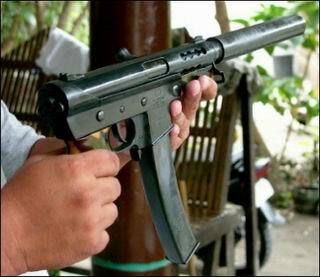 “After the fireworks, we showed him a Danao-made revolver chambered for the M16 ammo. The gun even had the S&W logo engraved on the frame. “He shook his head and said that this ammo is not made for a revolver, but he took a lot of pictures of the gun from all angles. He tried the action but did not attempt to fire the gun, I am sure he was scared. Then in the ’90s, they started tinkering with the semi auto, the 1911A1 in particular. It was followed by the 9mm, .380 and the cal.40 S&W. they all proved successful. As a postscript, the mid-90s saw major efforts being thrown at organizing the gunsmiths of Danao to make their operation legal. The moves found a sympathetic ear in then Recom 7 chief Jose Andaya, who recognized that the only way to beat the proliferation of unlicensed gun is to license the makers and regulate their trade. These efforts paved the way for the creation of the Danao Arms Manufacturing Corp., a private firm set up by Byron Garcia, and the workers league of Danao, a multi-purpose cooperative. But the lack of government support in research and development as well as almost non-existent access to quality materials and metallurgy doomed the two ventures and forced the gunsmiths to go back in the black once again. I strongly believe that these talented smiths will resurface once they see the government being earnestly serious in legalizing their operation by helping provide an environment that can sustain their trade.